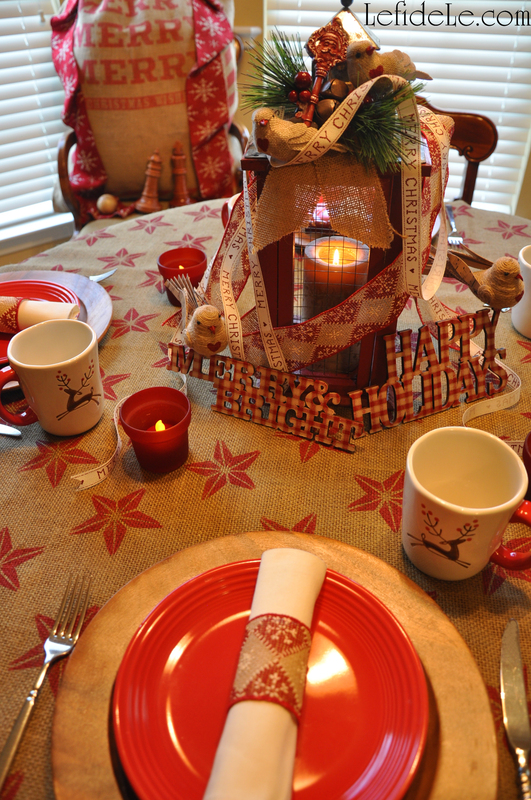 Why prepare for Christmas by waiting in long lines at overcrowded stores when you can create heartfelt moments with loved ones while crafting a homespun holiday that harkens back to simpler times. 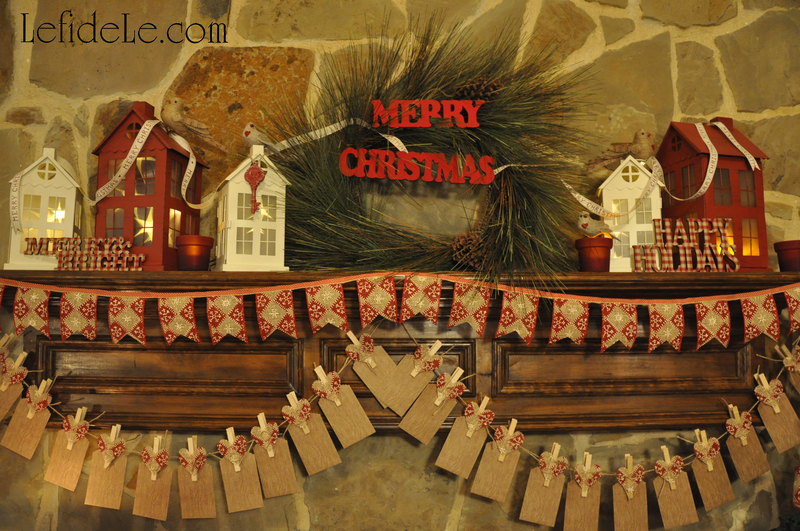 Deck the halls without breaking the bank using my easy craft tutorials for DIY décor that harmonizes perfectly with the season’s traditional crafts of gingerbread houses and strung cranberries or popcorn. 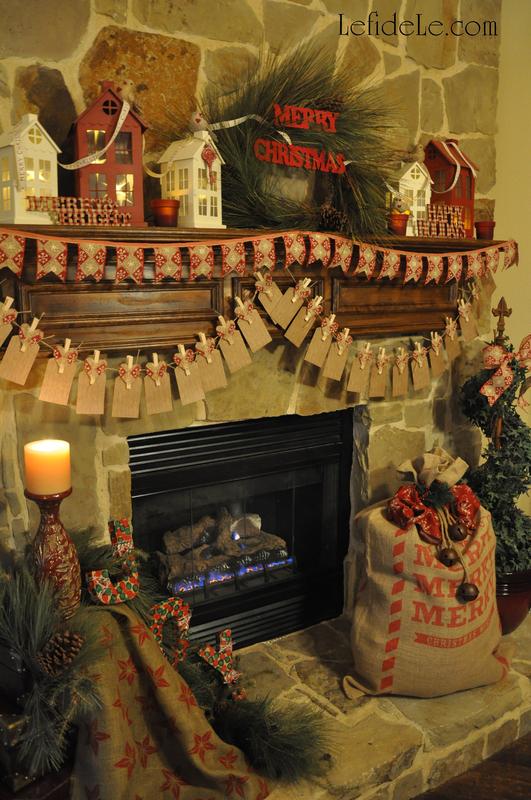 Have friends over for a cookie decorating or gift wrapping party, and then move the décor over to the mantel in time for a cozy Christmas. 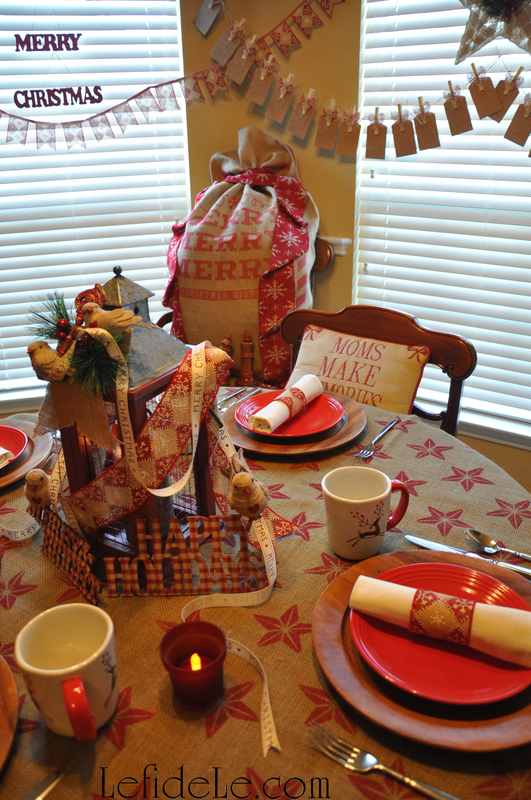 In this way, we can all celebrate togetherness in the real spirit of the season! 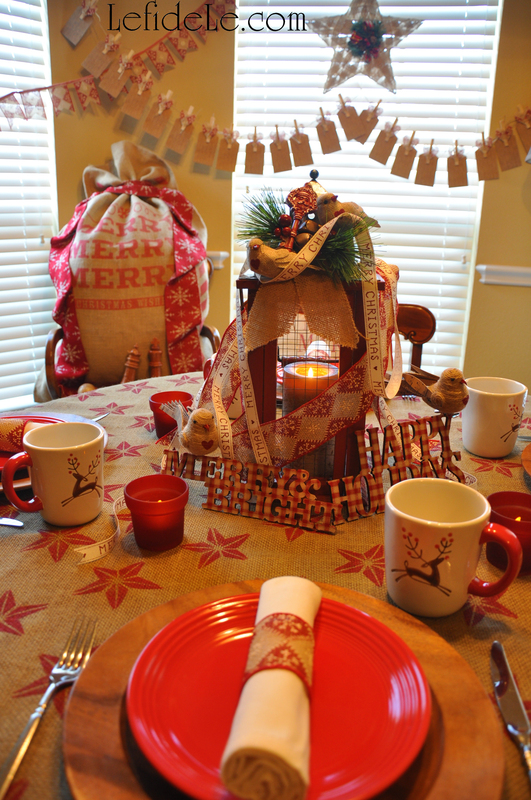 “’Tis the season to be jolly” and nosh on gluten-free vegan gingerbread cake served upon red ceramic plates over wooden chargers accompanied by holiday reindeer mugs filled with steaming cups of hot chocolate and homemade marshmallows. “Sing we joyous, all together, heedless of the wind and weather. 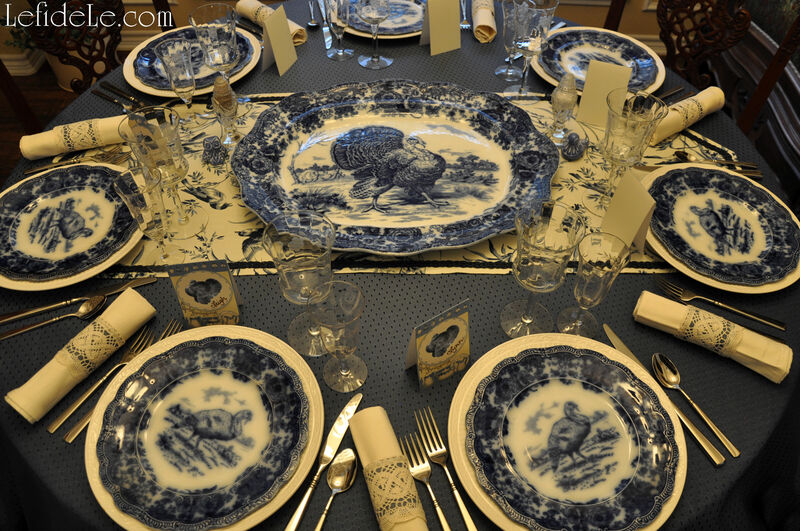 Offer Thanksgiving for those loved ones who have remained true blue through the past year with a dinner party featuring a fresh blue color scheme, ubiquitous holiday turkeys, and modern china that complements family heirloom dishes and crystal. 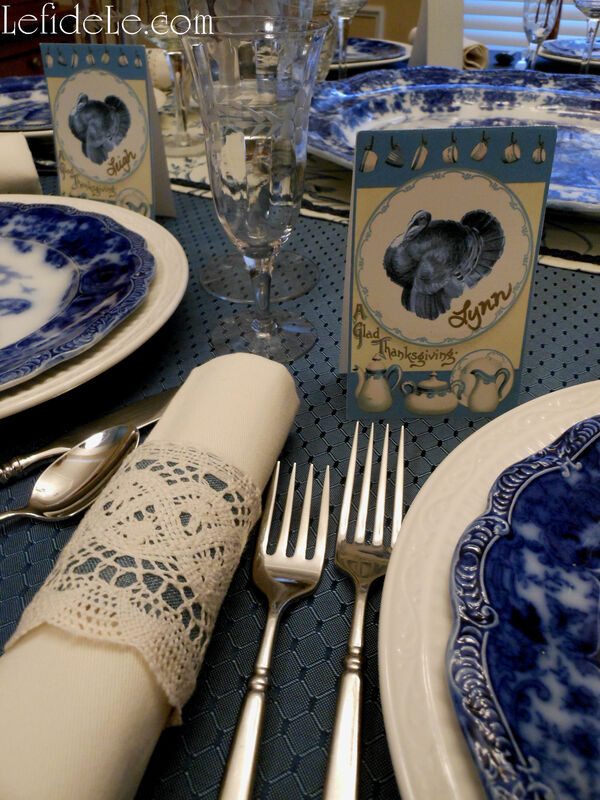 This is the perfect way to symbolically honor ancestral tradition while celebrating present day family as well… because family is made from so much more than DNA. 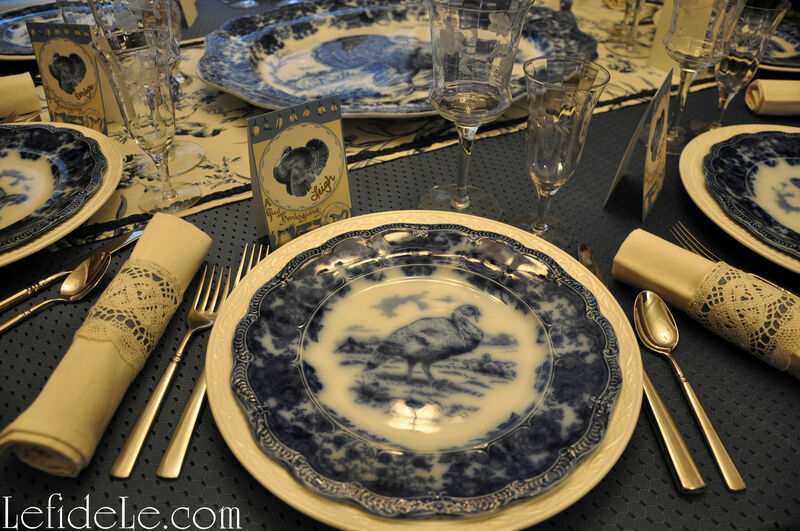 The beautiful 10 inch antique turkey plates are used as salad plates in this modern setting, though they functioned as dinner plates during the era in which they were made. 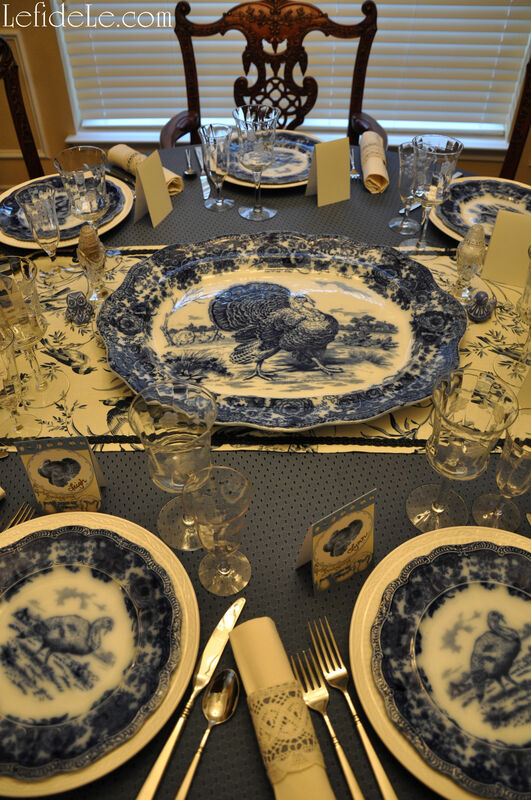 They are placed upon ivory patterned dinner plates, by Mikasa Italian Countryside, which are technically vintage even though the pattern is modern as they remain open-stock. 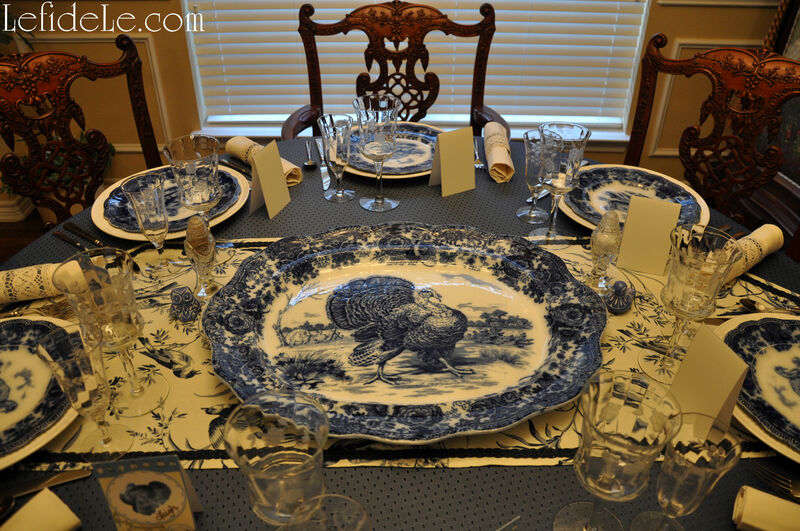 The wild tom turkey patterned platter and dishes featuring scalloped edges, by Flow Blue by Ridgeways England, are family antiques made in the late 1800s. They were originally purchased by my Great-Great-Grandmother. The delicate crystal stemware displays a subtle floral motif that echoes the bouquet border of the dishes. They were inherited from another line of the family. 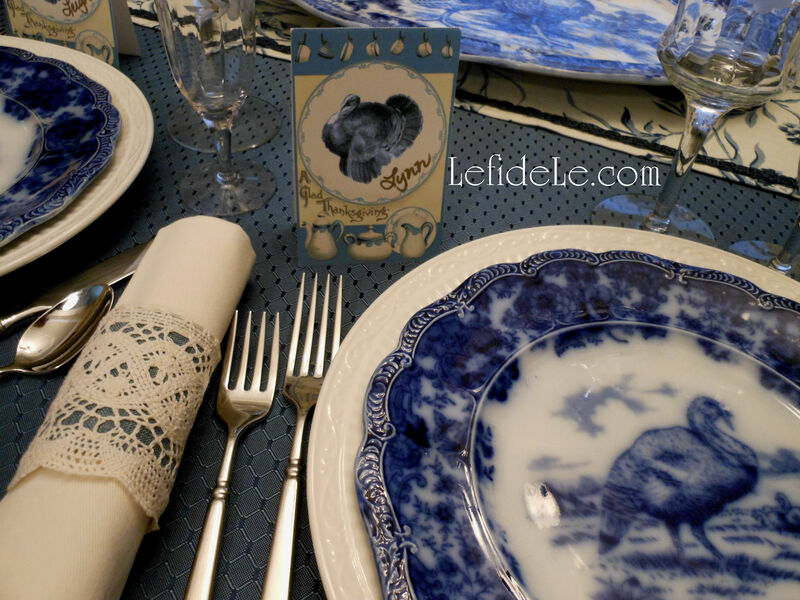 Stretched across a blue patterned tablecloth is a joyfully patterned runner sporting bluebirds of happiness. This was kindly crafted by my mother who hand-stitched the navy trim border just for this occasion. Guarding the antique crystal salt and pepper shakers, of yet another pattern, are a blue owl and blue bird handcrafted by an artisan in Chile. P.S. 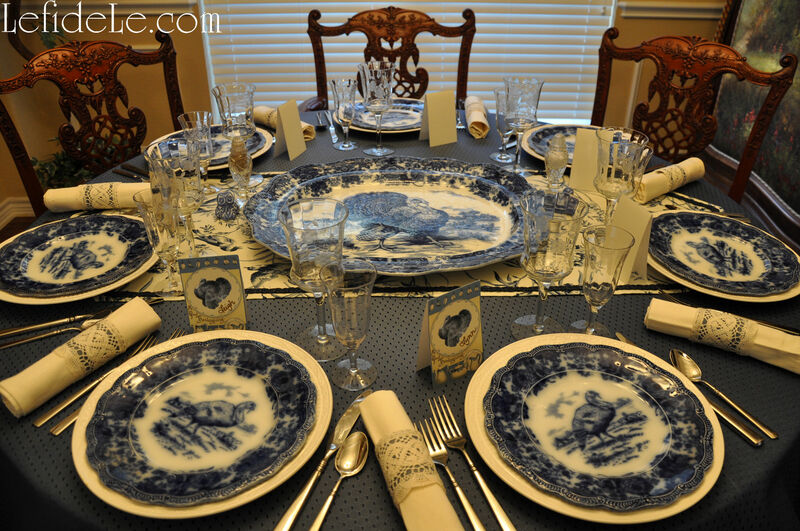 If you have any trouble identifying your own pattern of crystal or china, there is a reputable company who will identify it by picture for free! 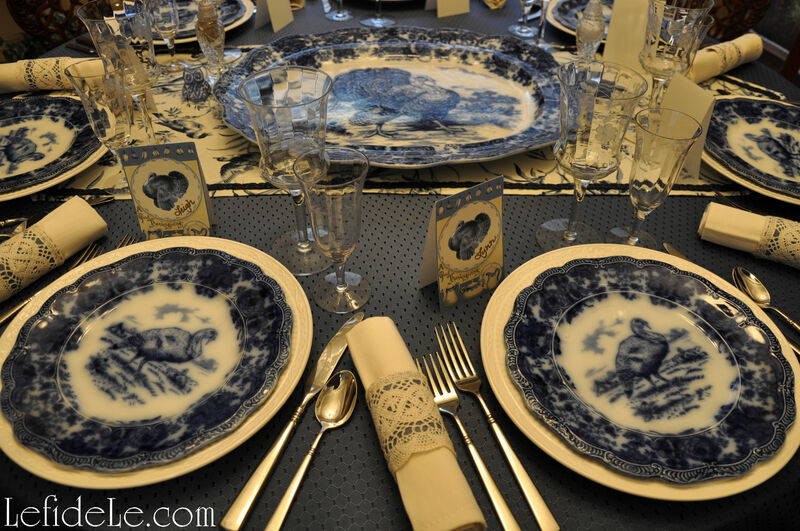 Just upload images to http://patternid.replacements.com/ They are researching the stemware seen above for me. I’ll add a comment with the information when I find out! P.P.S. 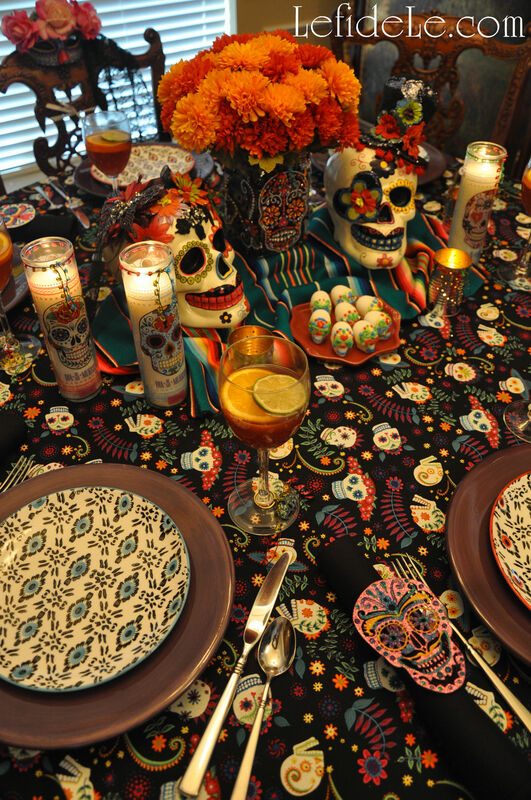 Also, if any of you out there are interested in purchasing anything you see in my articles, from party supply sets to dishware, just send me a reasonable offer via the contact page! 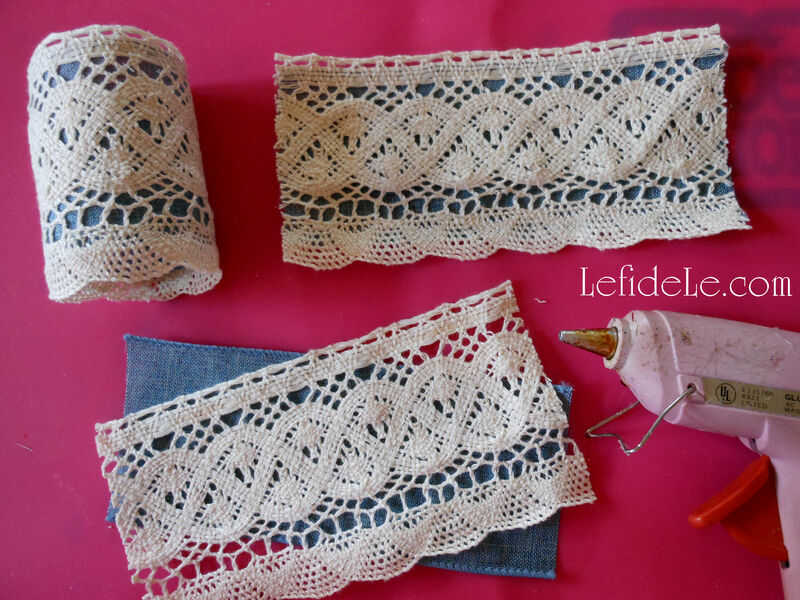 Easily DIY your own antique looking napkin rings crafted with crochet trim to coordinate beautifully with any china pattern for your Thanksgiving. 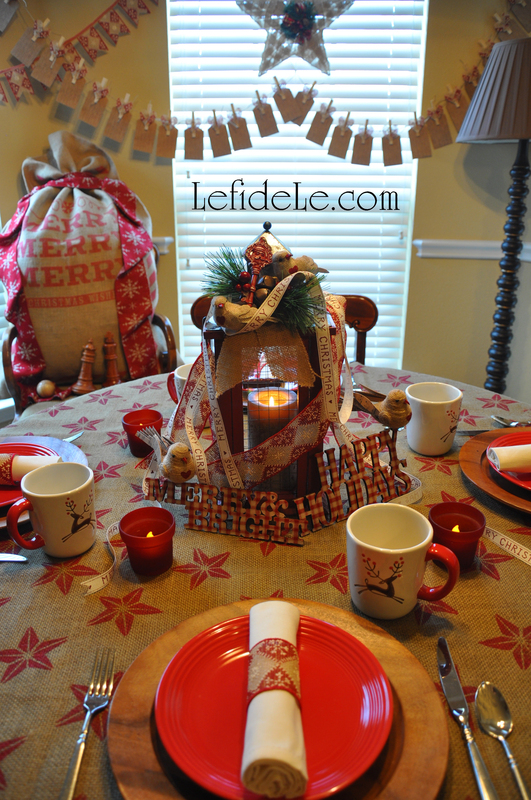 Then make place-cards using my free turkey and china printables that will double a doggie bag tags when the evening closes. 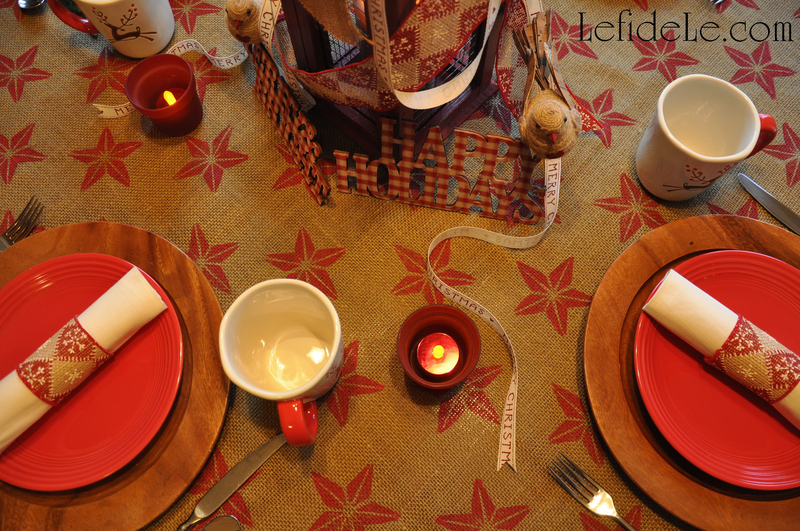 Also, print some to use as food tents cards to identify pies or even as thank you notes or tags for hostess gifts. These really look like they could have been inherited, but took mere minutes to make. 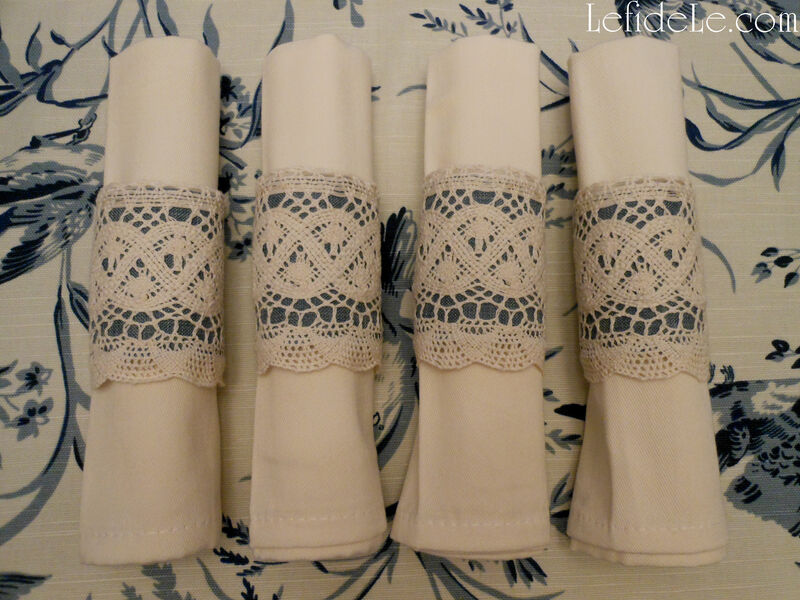 The napkin rings serve as a beautiful bridge coordinating my antique china with my modern linens, and they can do the same for you too! To make your own, right click on the image above and select print. 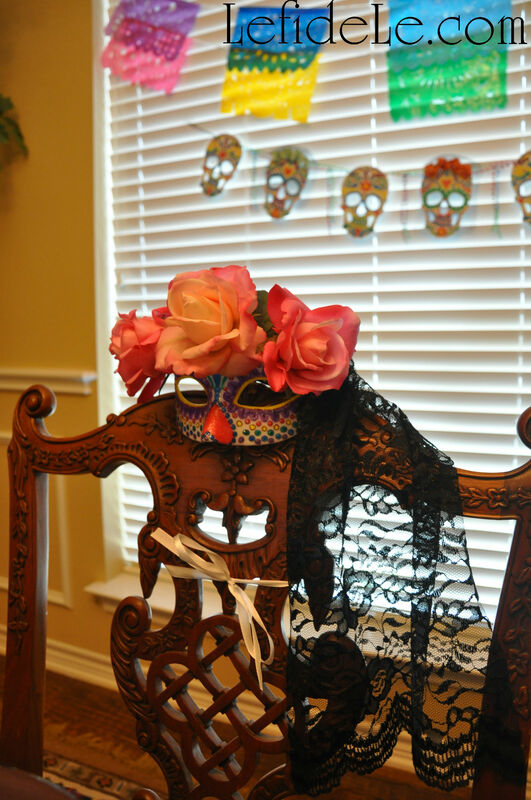 Choose color and photo settings, and print them on sturdy cardstock paper. 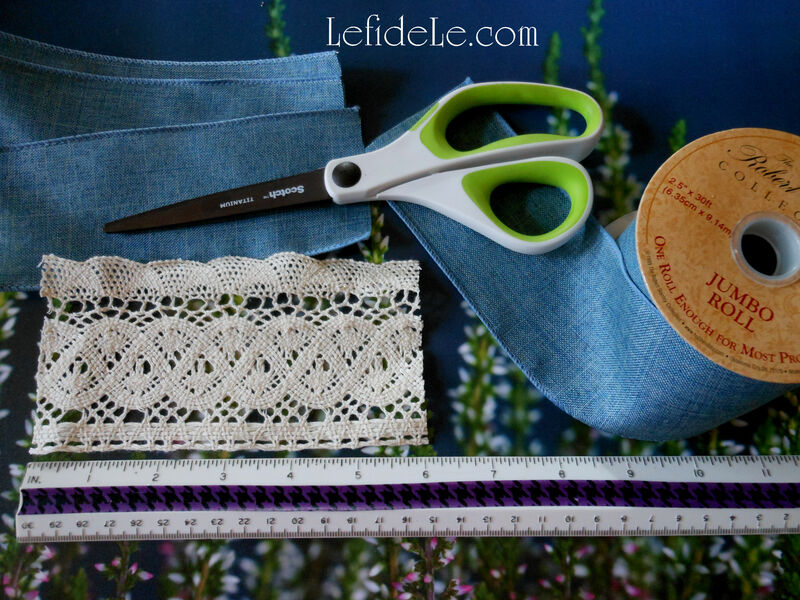 Cut along the image edges and dotted lines (or coax a relative into helping) then fold in half. Voila! 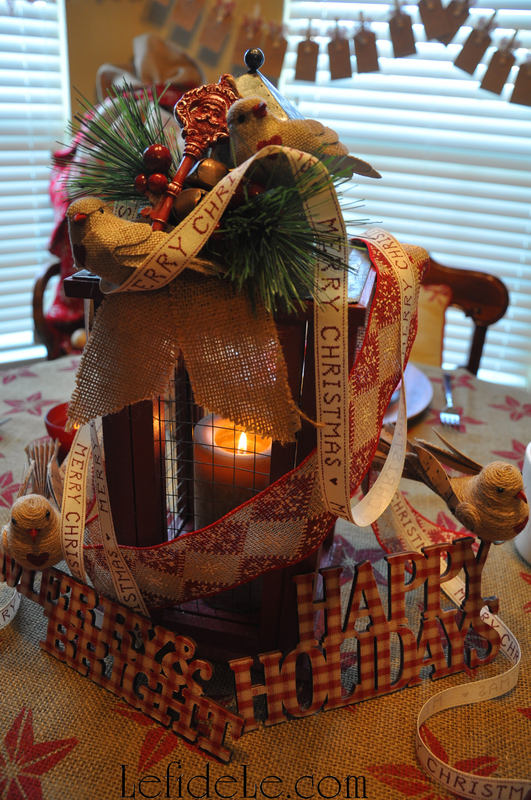 Use these as place-cards during the meal (to strategically place guests for mealtime peace), and then attach them as labels for individual pie boxes or doggie bags (to ensure the holiday pounds are well distributed). 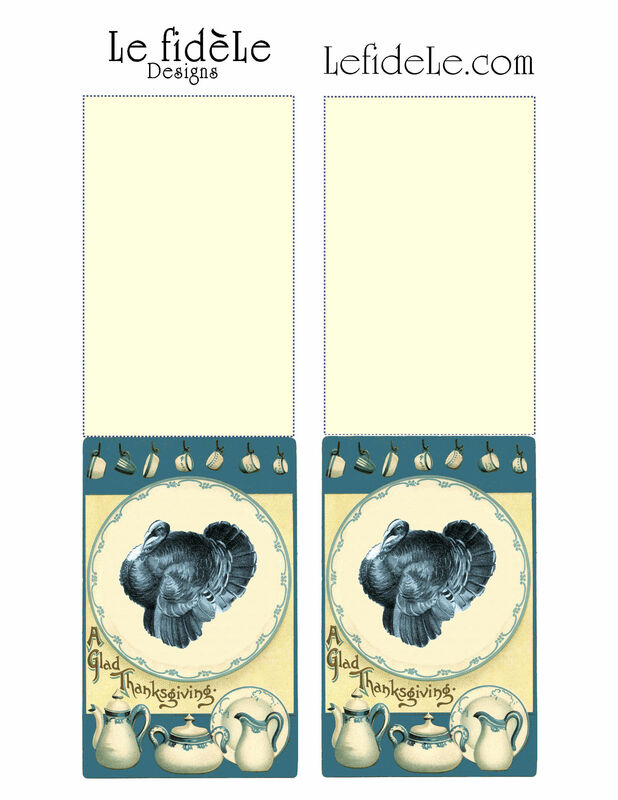 These also make great hostess gift tags, thank you notes, or even food tent cards (to properly identify the mysterious pie everyone keeps asking about… in my family that would be Chess Pie). 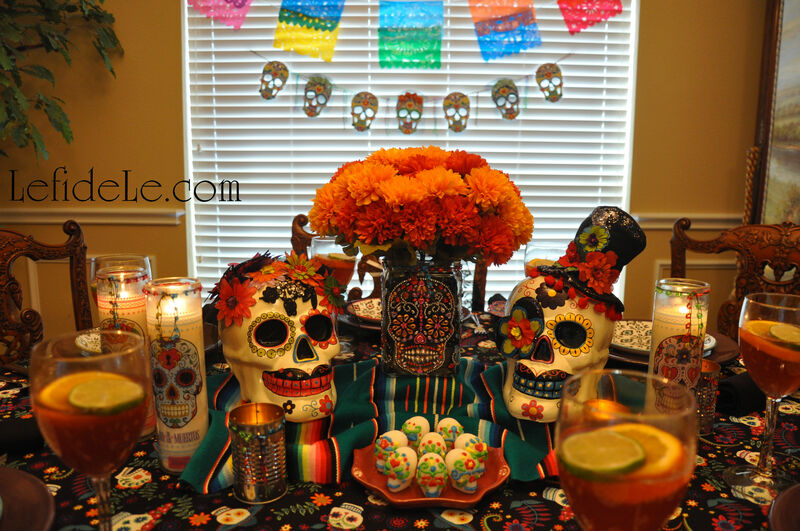 Celebrate Halloween with a Dia de los Muertos (Day of the Dead) themed dinner party filled with decorative sugar skulls (calaveras de azucar in Español) that embrace the lighthearted American holiday while still honoring Mexican traditions. 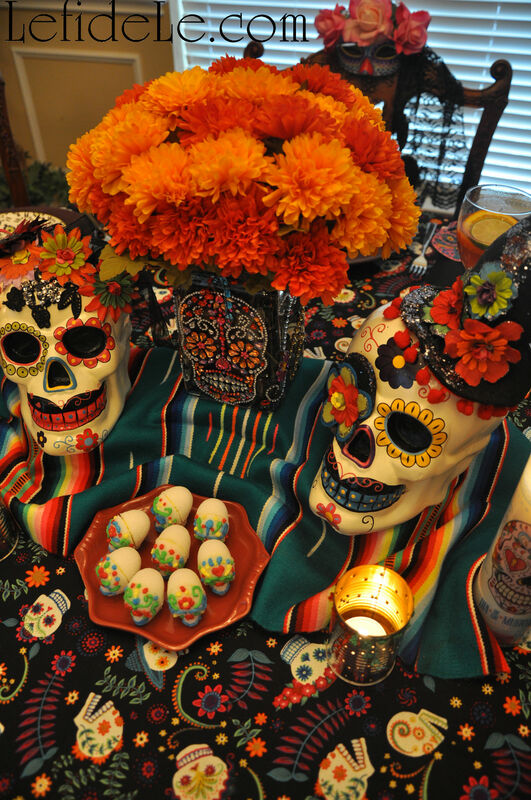 Sugar (azucar) is said to balance the bitterness of death (muerte), and calaveras are traditionally offered on All Saint’s Day (November 1) to departed loved ones as one would leave flowers graveside. 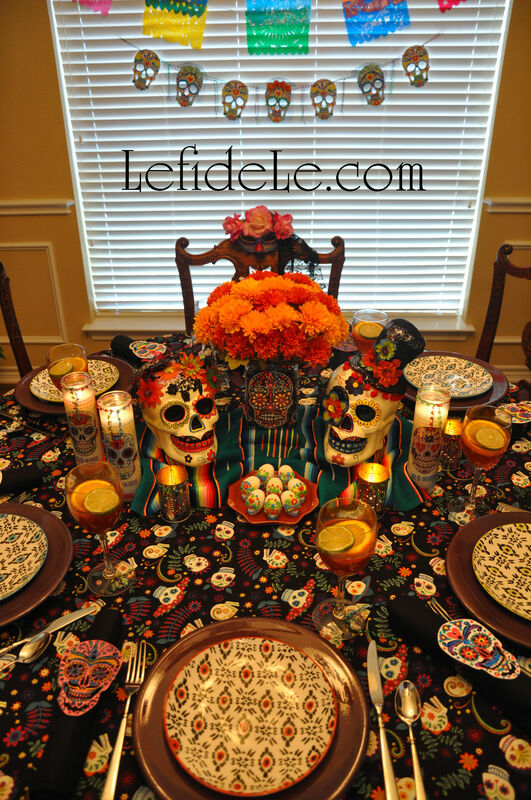 As Halloween serves to poke fun at all things scary, Dia de los Muertos is intended as a way to accept death as inevitable… and also to honor dearly departed loved ones. 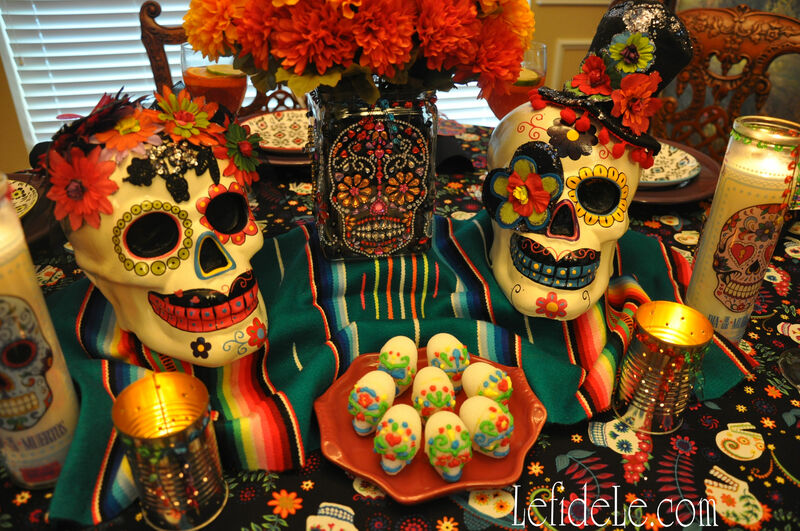 Representational calacas (colloquial term for skeletons) symbolize the idea of life being inextricably linked with death, and have migrated north from Mexico into American Halloween celebrations as themed décor. 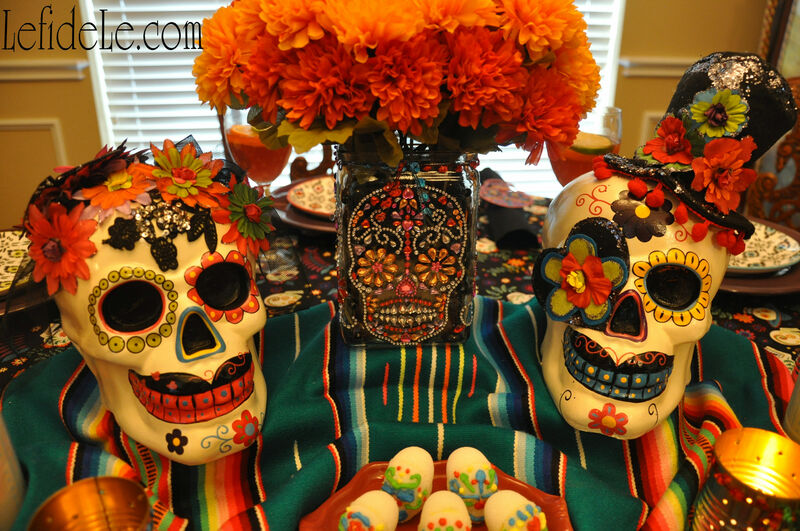 By using one celebration as a theme for the other, the two concepts combine to poke a little fun at death as not being so scary!